Best Tire Sealant to Fix FLAT TIRE On Your Bicycle? If you own a bicycle, you are aware of the fact that there are always some new things that need to be fixed or done around them. Sometimes you are going to face difficulties while trying to repair certain parts, but, luckily, there are many good products and information that can provide you with the most efficient process of doing it. That is why we are here today! We want to help you with fixing a flat tire on a safe, quality and easy way because your two-wheeler deserves nothing less. First, we must say that the best way to deal with a flat tire is just to get a new one. However, sometimes your inner tube has some smaller holes or damages, so the option of fixing that old one fits just right. This product is very useful because it repairs and prevents flat tires that were punctured by different kinds of objects. Slime is a liquid that carries binders, clotting agents, and fibers to the puncture. It uses Fibro-Seal technology in order to form a flexible plug inside of the tire. That plug seeks out a treated area and it instantly seals it. It is flexible, long-lasting and it repairs tires up to 3 mm in diameter. The plug prevents further damages and keeps the tire safe up to two years. It is good to replace it after that time since it is just a liquid so it can dry out. A great thing about Slime Tube Sealant is that it’s really safe. It is non-hazardous, non- corrosive, non-toxic, non-flammable and water soluble. No need to wonder how you are going to use this product because of the general application instructions on the back of your bottle. They are really simple to follow. The thing is that you just have to check the chart with general tire and tube sizes and see what you need it for. That way, you will easily realize what’s the amount you suppose to use. While fixing your flat tire for bikes, you will have to use 4 ounces for each tire, which means 8 ounces for both of them. Do not be afraid to use some extra ounces. For example, if it says that you have to use 4 of them, feel free to use up to 8 on the same tire, just to make sure that everything will be sealed up good and real tight. The first step is just to make sure that the valve on the tire is in the top half of the bike. Start your process with taking off the top tool which is actually cap for the slime. Next step is to slowly remove the valve core. What is valve core? It is a metal cylinder that you can find in the center of your tire valve. In order to apply Slime Tube Sealant properly, you have to use this black top thing on the cap of the bottle. It is actually a valve core removal tool. Just get it right up to the inner tube valve. You will feel when it catches there and clicks. Now just slowly screw it out. It is a small piece so be careful and do not lose it. The third step is just to take that hose you got with the bottle. Before continuing with the process, please, make sure to remove all the obstructions you may find on your tire. If you leave them there, they can bother you in the further process or increase chances for your tire to get damaged again. As it is said, take that little tube we mentioned and put it on top of your bottle. Push it in real tight so it doesn’t come off. That way you get a good clean seal. After that, just do the same thing on your inner tube valve. Squeeze your slime nice and steady, right into the tire. Watch how much liquid you are putting in there and keep up with the instructions we were talking about in a previous section. The fourth step is just replacing your valve core. Slip it in and just turn it until it stops like you are putting the lid back on a bottle. You have to make sure that it holds everything in, but do not go too tight. Well, that’s it! Now you are done, ready to pump up the tire and finish your process. There are plenty of other ways to deal with a flat tire, of course. However, we are going to present you one more. Next part is about using a patch kit on a punctured inner tube. First, you have to remove tire and tube from the rim. While removing all of that, make sure the tube is completely deflated. Loosen the bead from against the rim sidewall by pushing both sides of the tire toward the center. Use tire lever anywhere except at the valve. Take the bead out of the rim. You have to feel that bead is becoming loose. Remove the second bead as well. Use levers whenever you think it is necessary. While checking the punctured area, reinflate your inner tube to at least twice its normal width. That way it will be easier for you to find leaks, because even the smallest holes will be detectable. Make sure you inspect the entire tube. If you cannot detect punctured area, just immerse tube underwater. Seeing the bubbles will help you detect each hole. Mark it (or them) with your marker and deflate the tube again. Make sure you check your tire to remove anything that caused puncture at the first place or could cause some new ones. Remove objects from the inner and outer side. Inspect the rim too – clean it and remove even the smallest obstructions that could damage your tube again. Rim supports the inner tube so it is quite important to clear that area. When you detect a hole, you supposed to clean it. The patch kit comes with the sandpaper, so you can use that. Just scrap area that is a little bit larger than your patch. After that, take your patches. 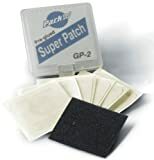 Our tips are going to be related to pre-glued patches like the Park Tool GP-2, which you can also get on Amazon. Just peel off its backing and put the patch squarely over the hole. Seal the hole firmly by applying some pressure to the patch. Don’t inflate your inner tube outside of the tire after you already put your patch, because it can weaken the bond and pull on the patch. Okay then, your tube is ready to get back inside the tire. When installing tube and tire back, fill the tube with just enough air to hold its shape. Put your inner tube inside the tire, and try to find the right pressure. You can find proper recommendations written on the inside of your tire. While engaging the valve stem into the rim, make sure to align it properly, so that it is not crooked. Put your inner tube first. After you set it properly, stuff the tube inside the tire body. Push the other bead up and into the rim, but begin at the valve. Feel free to use tire levers to finish the installation when you think it is necessary. Be careful around this process and try not to pinch or damage the inner tube. If you don’t install everything properly, you can increase the chances for your tube to get damaged again. Partially inflate the tire then, and check to make sure everything is seated. If you are done with that, inflate your tube to the end and go, enjoy your ride! If your inner tube is flat but you can’t see any holes, you should check the inner tube valve. Put some soapy water on the valve and see if there are any bubbles. In that case, you should tighten them by using a regular valve core remover that would be proper for your bike. Take care of your two-wheeler because we all know how much joy, fun and good times they can bring. We hope this was helpful, easy to understand and useful for you. So, after you have done all you could, hop on your bike and get ready for more adventures!